By Regina Glick on July 21, 2016. Effective office rents in Manhattan rose during the second quarter as asking prices and concessions headed in different directions. Year-over-year, however, incentives like free rent and cash offered to tenants to build out their spaces continue to outpace the growth in asking rents. Across the borough’s three office submarkets, effective rents grew 4.07 percent from the beginning of the year to $67.44 per square foot, according to CompStak data provided to The Real Deal. Concession values –the incentives landlords offer in terms of free rent and tenant improvements — during that time fell slightly to 13.36 percent of asking rents, which climbed to $70.90 per square foot. Year-over-year, concessions grew 22.26 percent, while asking rents climbed 14.04 percent. “That represents a considerable year-over-year increase of 14.41 percent [in effective rents] and an indication of a bull market,” CompStak said in the report, which noted that despite the slight downturn, concessions remain at relatively historic highs. Concession values held relatively steady in Midtown, where taking rents grew 4.33 percent on the quarter to $73.40 per square foot. Effective rents in Midtown South grew 2.06 percent to $63.60 per square foot after flat growth in the earlier part of the year. Average concession values “remained elevated, around 12 percent [of asking rents] in the quarter,” CompStak wrote. In Downtown, average effective rents grew 1.98 percent in the second quarter to $49.58 per square foot, or 18 percent year-over year. The availability rate in the submarket surpassed that of Midtown for the first time in more than three years, according to CBRE’s TRData LogoTINY second-quarter analysis. 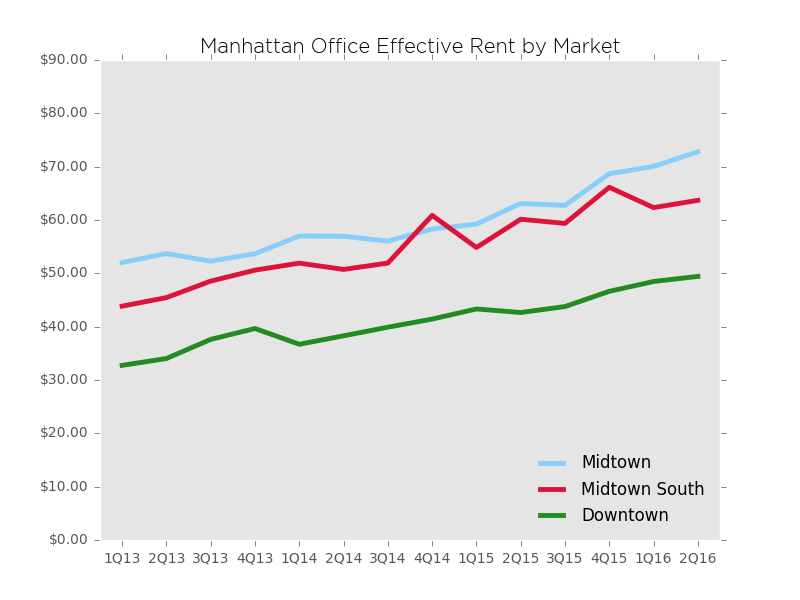 According to Colliers research, Manhattan asking rents are less than 50 cents off from where they were at the last market peak in the third quarter of 2008. Honest Buildings: CompStak CEO: CRE Tech Laggards are Finally Ready to Buy in.